The capital of Rhineland-Palatinate is immediately recognisable by the pink-reddish sandstones of its buildings. The old seat of a Archbishopric and Electorate, Mainz is a city of churches, and paramount among them is the Mainzer Dom, the city's 1000-year-old cathedral, and one of the largest Romanesque edifice in northern Europe. If you like medieval churches, the cathedral is a must see. The adjoining market square is pretty enough and the Gutenberg Museum next door celebrates the invention of the priniting press by the city's most famous historical resident. Some of its most valuable displays are two original Gutenberg Bibles of the mid-15th century. Immediately south of the cathedral, the so-called Kirschgarten ('cherry garden') square was beautifully restored in the traditional red-and-white timber-framed style. 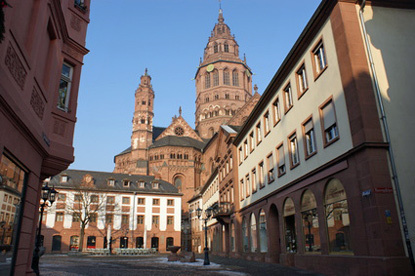 Mainz was founded by the Romans and served as the capital of Upper Germania. Remains of the Roman aqueduct and the Roman theatre can still be seen. Roman artefacts found during excavations are on display at the Romano-Germanic Central Museum. Six 4th-century Roman boats were found partially preserved and two of them were reconstructed to their original state. They can be viewed at the Museum of Ancient Seafaring. Although most of the city is made up of uninteresting post-war buildings, a few pink sandstone palaces were restored to house government offices, as Mainz is also the capital of the state of Rhineland-Palatinate. At the southern end of the old town rises the Citadel (Mainzer Zitadelle), also built in the distinctive local pink and white architecture. Other local museums include the Provincial Museum of the Central Rhineland, the Natural History Museum of Mainz, and the Diocesan Museum.